The windscreen washer fluid level should be checked regularly and topped up as necessary. 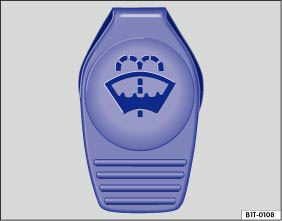 The washer fluid reservoir is identified by the symbol on the cap . Check whether there is enough windscreen washer fluid in the reservoir. To top up, mix clean water with a washer fluid recommended by Volkswagen . Observe the dilution instructions on the packaging. At low temperatures, add a special anti-freeze agent so that the fluid cannot freeze . For warm weather: summer windscreen wash - G 052 184 A1 - . Dilution 1:100 (1 part concentrate, 100 parts water) in the washer fluid reservoir. All-year washer fluid - G 052 164 A2 - . Dilution in winter to -18°C (0°F) approximately 1:2 (1 part concentrate, 2 parts water), otherwise dilute one part concentrate to four parts water (1:4) in the washer fluid reservoir. The capacity of the washer fluid reservoir is approximately 3 – 4 litres and approximately 3 – 6 litres in vehicles with a headlight washer system. Never mix anti-freeze or other unsuitable additives into the windscreen washer fluid. These may leave an oily film on the screen, restricting the field of vision. Use clean, clear water with a washer fluid recommended by Volkswagen. A suitable anti-freeze agent should be added to the windscreen washer fluid if necessary. Never mix other cleaning agents with the cleaning agents recommended by Volkswagen. This can cause the ingredients to separate and block the washer jets. Never mix up service fluids when refilling. Failure to observe this warning can result in serious malfunctions and engine damage.